It’s tax season, and US residents are thinking hard about that deadline (although this year, thanks to a holiday, you have until Monday, April 18, to file). As you gather up your forms, papers, and shoeboxes of receipts and pour a strong cup of coffee, remember to think about how your writing affects your taxes. Whether you’re a full-time freelance writer, a weekend blogger, or publishing as part of your regular career, writing at a professional level carries with it some duties and deductions at tax time. Whenever you do work for a person or company, even if it’s just writing a Hallmark card as part of your side hustle, you must fill out a W-9 form. This makes sure that the company you’re freelancing for has your tax information on file. If the amount they pay you for various work exceeds $600 in a year, they’re required to send you a 1099-MISC form, which lists exactly how much they’ve paid you. Even if a company doesn’t send you a 1099, you must report what you earned from them on your taxes. You have been keeping track of all the payments you receive, right? So it’s pretty easy to add up all your freelance income and report it on Schedule C of your 1040 return. Are you totally self-employed as a writer? Then you’ll need to pay quarterly estimated taxes to both the state and federal government. This means that once every three months (in April, June, September, and January), you need to send in a check along with form 1040-ES, paying approximately the taxes that would’ve been withheld if you worked for someone else. It can be tricky to figure out exactly how much you need to send in, but worksheets are available through the IRS that can help you. At tax time, you’ll write the total amount you paid in quarterly payments on the “Payments” line of your 1040 tax return (line 65). That’ll get you credit for what you already paid. Keep every receipt conceivably related to your writing business. If storing them is a problem, invest in a scanner (You can deduct it! More on that later. ), and keep everything in meticulously labeled and backed-up folders on your computer for the day the IRS has a question about something you’ve reported as income or a deduction. To offset what you owe in taxes, you can claim a number of deductions related to your work as a writer. “Deductions” is a fancy term for “permitted expenses,” or money you had to spend to make money writing. They lower the amount you’re taxed on; so if you made $50,000 as a writer, but spent $20,000 on permitted expenses related to your writing, you’d only be taxed on $30,000 of income. Many writers work from home, so you get to take the home office deduction, right? Not so fast. There are many criteria that have to be met to allow you to use this deduction. Wherever you work has to be set aside only for work; you can’t work at the dining room table and claim that as your office. There are two ways to calculate how much you can deduct for your home offices; the IRS has a worksheet comparing them. If you work at a co-working space and pay a membership fee, you can deduct this on your taxes. You can deduct an awful lot here! Paper, pens, printer ink, postage, and copying fees are all normal deductions. But did you know that you can also deduct the cost of that new laptop and your Office 365 software subscription, as long as you’re using the computer or software for business purposes? 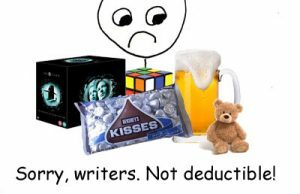 If you’ve joined a professional group that has annual dues, like Science Fiction Writers of America or the Education Writers Association, you can deduct that. You can also deduct magazine subscriptions related to your writing and the cost of professional conferences you attend. Did you have to travel to get to that professional conference? Did you need to drive to a meeting with a client? Keep track of how much all that cost, along with mileage logs, gas receipts, and receipts from lunches or dinners with clients. All of this is deductible (although you only get to deduct 50% of meal expenses). There are many, many more deductions available, all depending on your personal circumstances. The Freelancer’s Union offers a good list of possible deductions to help you get started, but in the end, you’ll want to get the advice of a tax professional who works with freelancers in order to get the most valid deductions for your situation. And guess what? That advice is deductible too. *Not a certified tax professional. All the information in this blog post is given for informational purposes only and should not be relied on for, tax, legal, or accounting advice. You should consult your own tax, legal, and accounting advisors before engaging in any transaction or filing.